Gospel singer Kim Burrell has said she makes "no excuses or apologies'' for a sermon at a US church where she referred to gay people as perverted. 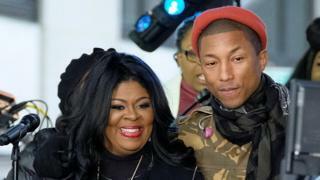 The singer, due to sing with Pharrell Williams on The Ellen DeGeneres Show this week, was taped at the Love & Liberty Fellowship church in Houston. She referred to "the perverted homosexual spirit" in her sermon. In a later video, Burrell said "I love you and God loves you but God hates the sin in you and me." "I never said all gays were going to hell. I never said 'LGBT'... I said 'SIN'," she added in the Facebook Live broadcast. "To every person who is dealing with the homosexual spirit, that has it, I love you and God loves you but God hates the sin in you and me. Anything that is against the nature of God. "I make no excuses or apologies. My love is as pure as it comes." She said "enemies" had posted only a portion of her original speech. Pharrell and Burrell are due to sing their track I See Victory from the soundtrack of the film Hidden Figures on the chat show on Thursday. The movie tells the story of a trio of African-American women working at Nasa whose skills helped put astronaut John Glenn into orbit in 1962. Following the circulation online of the video of the sermon, Pharrell posted on Twitter: "I condemn hate speech of any kind", although it is not clear if this is directly linked to Burrell's comments. Burrell and Williams are still listed to appear on DeGeneres' show later this week, along with Hidden Figures actress Janelle Monae. Monae re-posted Williams' post on Instagram with her own comments, including: "I unequivocally repudiate any and all hateful comments against the LGBTQ community. Actually I'm tired of that label. We all belong to the same community, a shared community called humanity." DeGeneres has been asked by fans to cancel Burrell's planned appearance and an online petition has also been launched.